I remember watching this with my daughter Joanna, a number of years ago and neither of us knew the storyline at all, so we were completely baffled by the way things developed and we could not work out how and what the conclusion would be. It seemed very sinister but everything fell into place at the end. Great film though and a terrific story. I really like this film and love the story !!! 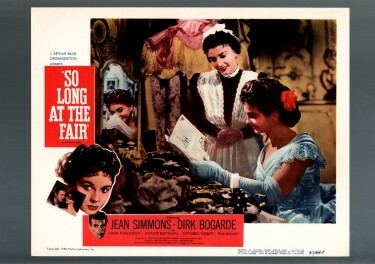 It took two directors, Antony Darnborough and Terence Fisher, to create SO LONG AT THE FAIR in 1950. This romantic mystery starred Jean Simmons, Dirk Bogarde, Honor Blackman, and David Tomlinson. Jean Simmons looked stunning as a visitor to Paris searching for her missing brother. It really was a mystery because he had just simply disappeared and no-one in the hotel seemed to remember that he had ever been there. So Long At The Fair – The Story. – Dont worry we don’t give away the ending !!! 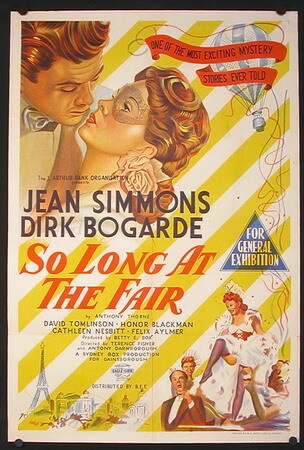 Bogarde and Simmons had never appeared in a film together before (and never would again) but they enjoyed a close working relationship on So Long at the Fair. Bogarde recalled, ‘Jean is about the sweetest girl you could wish to meet and all you read about her being natural and unsophisticated is absolutely true. She has a great sense of fun, and one of these days I would like to do a comedy with her.’ Simmons was equally complimentary saying, “He was such fun – a great giggler. I loved Dirk, and was hoping that perhaps we would be married one day; but I was dreaming, I was fantasising…I never really knew him. 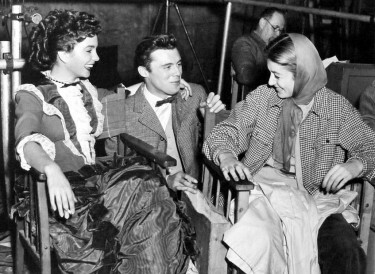 I didn’t realise he was gay – in those days people didn’t talk about it.” In another interview, Bogarde confessed that he actually didn’t care for So Long at the Fair, adding “but I had to do it, and at that point, I was very much in love with Jean Simmons. Rank thought it was a great idea to encourage their two juvenile stars and we were given this film which was supposed to launch our engagement. Unfortunately, by the time the film was finished Jean had fallen in love with Stewart Granger, thereby ruining the publicity effort.” Regardless of Bogarde’s own opinion of So Long at the Fair, however, it did help advance his career. One of the film’s producers, Betty E. Box, was so impressed with Bogarde’s performance that she thought of him for the lead in Doctor in the House (1954), the romantic comedy that catapulted him to major stardom in England and led to numerous sequels, two of which also starred Bogarde (Doctor at Sea , Doctor at Large ). Producer: Betty E. Box, Sydney Box, Vivian Cox Director: Antony Darnborough, Terence Fisher Screenplay: Hugh Mills, Anthony Thorne Cinematography: Reginald Wyer Film Editing: Gordon Hales Art Direction: Cedric Dawe Music: Benjamin Frankel Cast: Jean Simmons (Vicky Barton), Dirk Bogarde (George Hathaway), David Tomlinson (Johnny Barton), Marcel Poncin (Narcisse), Cathleen Nesbitt (Madame Herve), Honor Blackman (Rhoda O’Donovan). BW-86m.